For other uses, see Peter principle (disambiguation). The Peter principle is a concept in management developed by Laurence J. Peter, which observes that people in a hierarchy tend to rise to their "level of incompetence". In other words, an employee is promoted based on their success in previous jobs until they reach a level at which they are no longer competent, as skills in one job do not necessarily translate to another. The concept was elucidated in the 1969 book The Peter Principle by Peter and Raymond Hull. The Peter Principle was published by William Morrow and Company in 1969. Peter and Hull intended the book to be satire, but it became popular as it was seen to make a serious point about the shortcomings of how people are promoted within hierarchical organizations. Hull wrote the text, based on Peter's research. The Peter principle has been the subject of much later commentary and research. The Peter principle states that a person who is competent at their job will earn promotion to a more senior position which requires different skills. If the promoted person lacks the skills required for their new role, then they will be incompetent at their new level, and so they will not be promoted again. But if they are competent at their new role, then they will be promoted again, and they will continue to be promoted until they eventually reach a level at which they are incompetent. Being incompetent, they do not qualify to be promoted again, and so remain stuck at that final level for the rest of their career (termed "Final Placement" or "Peter's Plateau"). This outcome is inevitable, given enough time and assuming that there are enough positions in the hierarchy to which competent employees may be promoted. The "Peter Principle" is therefore expressed as: "In a hierarchy every employee tends to rise to his level of incompetence." This leads to Peter's Corollary: "In time, every post tends to be occupied by an employee who is incompetent to carry out its duties." Hull calls the study of how hierarchies work "hierarchiology." Laurence J. Peter had conducted the research that led to the formulation of the Peter principle well before publishing his findings. He worked with Raymond Hull on a book that elucidated his observations about hierarchies. The principle is named for Peter because although Hull actually wrote the book, it is a summary of Peter's research. The Peter Principle was published by William Morrow and Company in 1969. In chapters 1 and 2, Peter and Hull give various examples of the Peter principle in action. In each case, the higher position required skills which were not required at the level immediately below. For example, a competent school teacher may make a competent assistant principal, but then go on to be an incompetent principal. The teacher was competent at educating children, and as assistant principal he was good at dealing with parents and other teachers, but as principal he was poor at maintaining good relations with the school board and the superintendent. In chapter 3, Peter and Hull discuss apparent exceptions to this principle and then debunk them. One of these illusory exceptions is when someone who is incompetent is still promoted anyway. This is known as "percussive sublimation" (i.e. being "kicked upstairs"). But it is only a pseudo-promotion: a move from one unproductive position to another. This improves staff morale, as other employees believe that they too can be promoted again. Another pseudo-promotion is the "lateral arabesque", when a person is moved out of the way and given a longer job title. While incompetence is merely a barrier to further promotion, super-incompetence is grounds for dismissal. So is super-competence. In both cases "they tend to disrupt the hierarchy." One example of a super-competent employee is a teacher of children with special needs who was so effective at educating them that after a year they exceeded all expectations at reading and arithmetic, but the teacher was still fired because he had neglected to devote enough time to bead-stringing and finger-painting. Chapters 4 and 5 deal with the methods of achieving promotion: "Push" and "Pull." Push means the employee's own efforts, such as working hard and taking self-improvement courses. This is usually not very effective, because of the Seniority Factor: the next level up is often fully occupied, blocking the path to promotion. Pull is far more effective, and refers to accelerated promotion brought about by the efforts of an employee's mentors or patrons. Chapter 6 explains why "good followers do not become good leaders." In chapter 7, Peter and Hull describe the effect of the Peter Principle in politics and government. Chapter 8, entitled "Hints and Foreshadowings", discusses the work of earlier writers on the subject of incompetence, such as Sigmund Freud, Karl Marx and Alexander Pope. Chapter 9 explains that once employees have reached their level of incompetence, they always lack insight into their situation. Peter and Hull go on to explain why aptitude tests don't work and are actually counter-productive. Finally, they describe "Summit Competence": when someone reaches the highest level in their organisation and yet is still competent at that level. This is only because there were not enough ranks in the hierarchy, or because they did not have time to reach a level of incompetence. Such people often seek a level of incompetence in another hierarchy. For example, Socrates was an outstanding teacher but a terrible defence attorney. This is known as "Compulsive Incompetence." Chapter 10 explains why trying to assist an incompetent employee by promoting another employee to act as his assistant doesn't work. "Incompetence plus incompetence equals incompetence." Chapters 11 and 12 describe the various medical and psychological manifestations of stress which may result when someone reaches his level of incompetence, as well as other symptoms such as certain characteristic habits of speech or behaviour. Chapter 13 considers whether it is possible for an employee who has reached his level of incompetence to be happy and healthy once he gets there. The answer is no, if he realises his true situation, and yes if he does not. In chapter 14 various ways of avoiding promotion to the final level are described. Attempting to refuse an offered promotion is ill-advised, and is only practicable if the employee is not married and has no-one else to answer to. Generally it is better to avoid being considered for promotion in the first place, by pretending to be incompetent while one is actually still employed at a level of competence. This is "Creative Incompetence," and several examples of successful techniques are given. It works best if the chosen field of incompetence does not actually impair one's work. The concluding chapter applies Peter's Principle to the entire human species at an evolutionary level, and asks whether humanity can survive in the long run, or will become extinct upon reaching its level of incompetence as technology advances. Other commenters made observations similar to the Peter principle long before Peter's research. Gotthold Ephraim Lessing's 1763 play Minna von Barnhelm features an army sergeant who shuns the opportunity to move up in the ranks, saying "I am a good sergeant; I might easily make a bad captain, and certainly an even worse general. One knows from experience." Similarly, Carl von Clausewitz (1780–1831) wrote that "there is nothing more common than to hear of men losing their energy on being raised to a higher position, to which they do not feel themselves equal." Closely echoing Peter, Spanish philosopher José Ortega y Gasset (1883–1955) wrote, "All public employees should be demoted to their immediately lower level, as they have been promoted until turning incompetent." 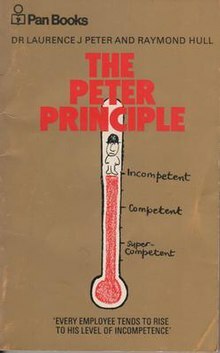 A number of scholars have engaged in research interpreting the Peter principle and its effects. In 2000, Edward Lazear explored two possible explanations for the phenomenon. First is the idea that employees work harder to gain a promotion, and then slack off once it is achieved. The other is that it is a statistical process: workers who are promoted have passed a particular benchmark of productivity based on factors that cannot necessarily be replicated in their new role, leading to a Peter principle situation. Lazear concluded that the former explanation only occurs under particular compensation structures, whereas the latter always holds up. Alessandro Pluchino, Andrea Rapisarda, and Cesare Garofalo used an agent-based modelling approach to simulate the promotion of employees in a system where the Peter principle is assumed to be true. They found that the best way to improve efficiency in an enterprise is to promote people randomly, or to shortlist the best and the worst performer in a given group, from which the person to be promoted is then selected randomly. For this work, they won the 2010 edition of the parody Ig Nobel Prize in management science. In 2018, professors Alan Benson, Danielle Li, and Kelly Shue analyzed sales workers' performance and promotion practices at 214 American businesses to test the veracity of the Peter principle. They found that these companies tended to promote employees to management position based on their performance in their previous position, rather than based on managerial potential. Consistent with the Peter principle, the researchers found that high performing sales employees were likelier to be promoted, and that they were likelier to perform poorly as managers, leading to considerable costs to the businesses. The Peter principle inspired Scott Adams, creator of the comic strip Dilbert, to develop a similar concept, the Dilbert principle. The Dilbert principle holds that incompetent employees are promoted to management positions to get them out of the workflow. Adams explained the idea in his 1996 business book The Dilbert Principle, and it has since been analyzed alongside the Peter principle. João Ricardo Faria wrote that the Dilbert principle is "a sub-optimal version of the Peter principle," and leads to even lower profitability than the Peter principle. Companies and organizations shaped their policies to contend with the Peter principle. Lazear stated that some companies expect that productivity will "regress to the mean" following promotion in their hiring and promotion practices. Other companies have adopted "up or out" strategies, such as the Cravath System, in which employees who do not advance are periodically fired. The Cravath System was developed at the law firm Cravath, Swaine & Moore, which made a practice of hiring chiefly recent law graduates, promoting internally and firing employees who do not perform at the required level. Brian Christian and Tom Griffiths have suggested the additive increase/multiplicative decrease algorithm as a solution to the Peter principle less severe than firing employees who fail to advance. They propose a dynamic hierarchy in which employees are regularly either promoted or reassigned to a lower level, so that any worker who is promoted to their point of failure is soon moved to an area where they are productive. ^ "Peter principle". Business Dictionary. Retrieved May 22, 2018. ^ Hull, in his introduction to the book. ^ a b Grudin, Jonathan (January – February 2016). "The Rise of Incompetence". Interactions. 23 (1): 6–7. doi:10.1145/2854002. Retrieved May 22, 2018. ^ "En el umbral de la incompetencia". La Opinión (in Spanish). Retrieved November 30, 2013. ^ Christian, Brian; Griffiths, Tom (2016). Algorithms to Live By. Henry Holt and Company. p. 219. ISBN 978-1627790376. ^ a b Lazear, Edward P. (October 12, 2000). "The Peter Principle: Promotions and Declining Productivity" (PDF). Hoover Institution and Graduate School of Business, Stanford University. ^ Pluchino, Alessandro; Rapisarda, Andrea; Garofalo, Cesare (2010). "The Peter Principle Revisited: A Computational Study". Physica A. 389 (3): 467–472. arXiv:0907.0455. Bibcode:2010PhyA..389..467P. doi:10.1016/j.physa.2009.09.045. ^ "The 2010 Ig Nobel Prize Winners" (PDF). Annals of Improbable Research. 16 (6): 10–13. 2010. ^ Benson, Alan; Li, Danielle; Shue, Kelly (February 2018). "Promotions and the Peter Principle". NBER Working Paper. 24343: 1–54. doi:10.3386/w24343. Retrieved May 22, 2018. ^ Faria, João Ricardo (January 2000). "An Economic Analysis of the Peter and Dilbert Principles" (PDF). UTS Working Papers. 101: 13–14. ISSN 1036-7373. Retrieved October 5, 2018. ^ Christian, Brian; Griffiths, Tom (2016). Algorithms to Live By. Henry Holt and Company. pp. 219–220. ISBN 978-1627790376. Christian, Brian; Griffiths, Tom (2016). Algorithms to Live By. Henry Holt and Company. pp. 219–220. ISBN 978-1627790376. Lazear, Edward P (October 12, 2000). "The Peter Principle: Promotions and Declining Productivity" (PDF). Hoover Institution and Graduate School of Business, Stanford University. Faria, João Ricardo (January 2000). "An Economic Analysis of the Peter and Dilbert Principles" (PDF). UTS Working Papers. 101: 1–18. Retrieved October 5, 2018. Peter, Laurence J. and Hull, Raymond. The Peter Principle, William Morrow & Co Inc, 1969 (Pan Books edition 1970).